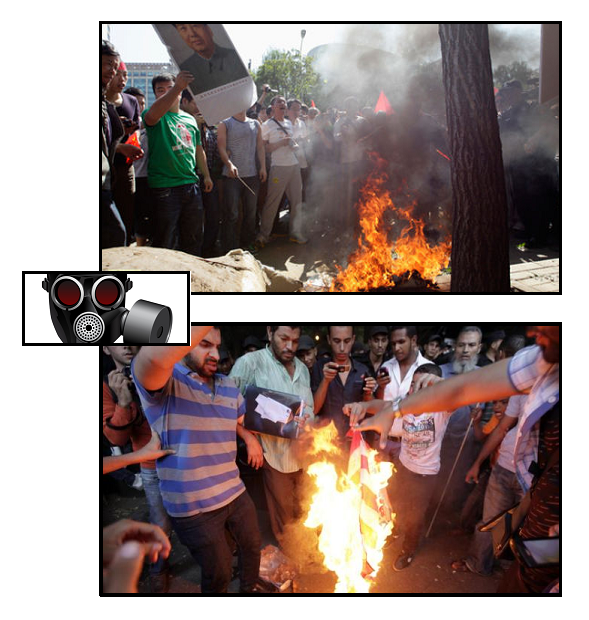 This week, the disputed sovereignty of some uninhabited islands has done the trick quite nicely in Beijing, where rioters have attempted to breach the Japanese embassy and burned the Japanese flag (upper image, above) in a manner that’s somehow reminiscent of the breaching of the US embassy and corresponding burning of the US flag (lower image) in Cairo . 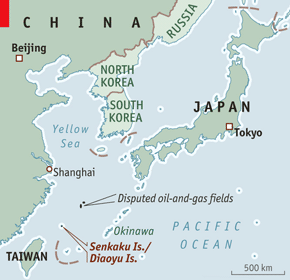 I imagine that if one was Japanese or Chinese, one might consider the Beijing protests over the ownership of the Senkaku / Diaoyu / Tiaoyutai Islands to be the primary troubling news-story about embassies, rioting and gross breaches of diplomatic protocol this week. There’s a strange kind of parallax involved here, I think. Or perhaps: what’s in the foreground depends on where you stand. But that’s not to say there’s an exact equivalence between the situations, just that bearing one in mind may shed some light on the other. I hope to get into the layers and layers of motivation that feed a riot in a subsequent post, but for now I’d just like to point to one similarity between the two situations. In each case, there’s an undertow of strong feeling that surfaces at a certain point — and astonishes us by its force. The dispute with Japan is now part of the legacy of World War II and China claims that under the Potsdam Declaration of 1945, Japan was obligated to return all the territories seized illegally. Note here that the question is expressly one of honor. I strongly believe that undertows, as I am calling them here, are among the most important topics for monitoring and analysis — and that the fact that they so often take us by surprtise is a good reason to pay them closer analytic attention. They surface in dreams, in graffiti, in conspiracy theories, in all the liminal spaces. And they can have game-changing impact: Great Game Changing impact. That, btw, is why Cass Sunstein‘s paper on conspiracy theories is one we should consider in detail here on ZP one of these days. – there are also oil and gas fields nearby. What drives a crowd to riot and what interests the powers that be may be two very different sides to the same affair. The Senkaku mole is an endangered species. Does comparing Beijing 2012 with Cairo 2012 change the emphasis with which you view recent events in Cairo and elsewhere? 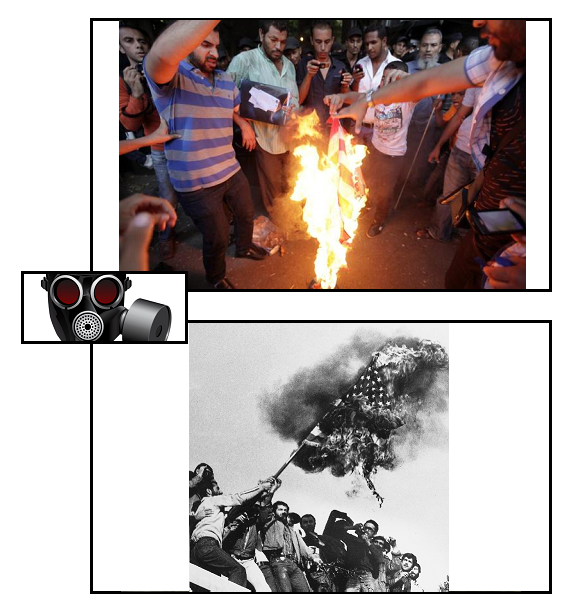 Do you find the analogy between Cairo 2012 (upper panel above) and Tehran 1979 (lower panel) more convincing? Analogy is an extremely powerful instrument of thought — and it’s about time we understood it as well as we understand linear logic.